MANILA, Philippines - Huge fire hits Banapple, a popular restaurant along Katipunan Avenue in Quezon City on Thursday evening, March 5. 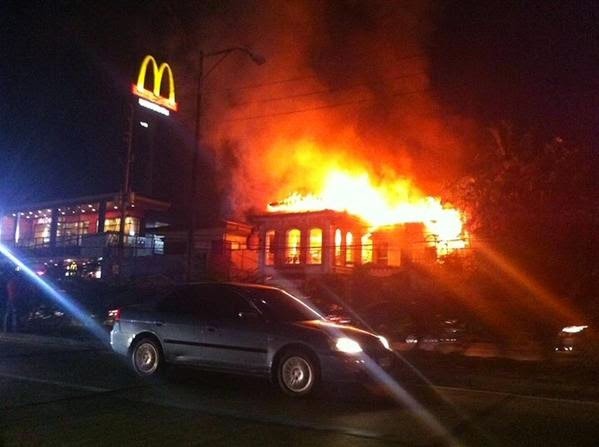 The Metro Manila Development Authority (MMDA) said that fire reached 2nd alarm around 9:13 in the evening. A netizen said that extra firemen desperately needed to control the ongoing fire. On the other hand, marketing manager of the branch has confirmed that their crew and staff are all safe. Reports said that fire started at the stock room of the restaurant around 9 p.m.
TxtFire Philippines, an online emergency dispatch server, said the fire was out as of 9:56 p.m.
MMDA said that the incident caused buildup of traffic in the area.